A CV or Curriculum Vitae is a highly- detailed document that chronicles your accomplishments in work, school and in other endeavors related to the field of specialization or the academia.... 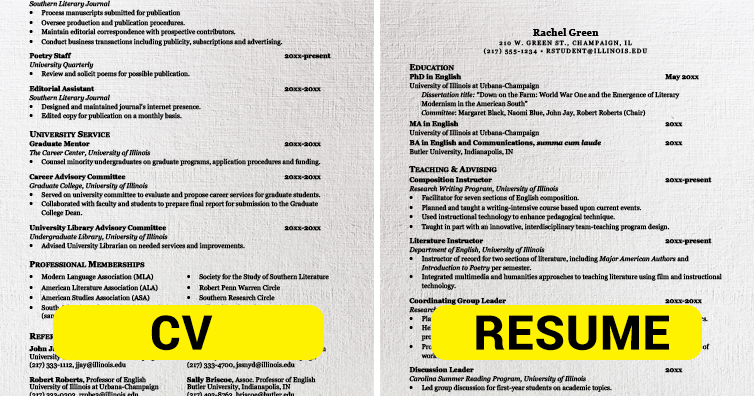 The key difference between a resume and a CV is in length. A CV (stands for Curriculum Vitae meaning Course of life in Latin ) is a 2 or more pages (generally 3-8 pages) long document which has in-depth details of your education, experience, achievements, awards, honors, publications etc in chronological order. To make that decision clearer � and to make the creation of your resume or CV easier for you � here are the biggest differences between the two documents. The Resume A resume is the typical document required of job applicants in the United States and Canada. As I said, the main difference between a CV and a resume is the length. So simply limit yourself to the essential details and this CV . So simply limit yourself to the essential details and this CV . Defining the difference between resume and CV and their peculiarities in different countries is crucial for everyone, especially for those, who are going to apply for a job overseas.